Li Kaixiang is Head of Wind and Strings Department at the Sichuan Conservatory of Music. 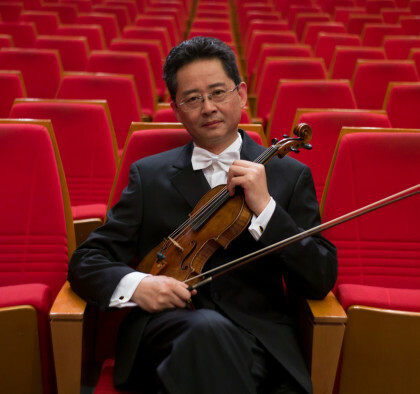 His passion has also led him to take on the Vice President position at the Violin Art Research Institute and President position at the Sichuan Violin Society. As an active artist in the field of Arts, Li Kaixiang received the ” Sichuan Outstanding Young Professional” Award as well as the “Sichuan Arts and Culture Award”. His artistic talent had won him the awards from the Ministry of Culture for the best Chinese Work, from the 5th China Arts Festival – Outstanding Performer Award and from the Sichuan Music Festival- first prize, amongst other major awards. As an educator, many of his students have successfully won awards in both national and international violin competitions. His excellence in teaching is acknowledged by, the Ministry of Culture and was awarded with the “Excellence in Teaching” and “Outstanding Educator Award” award. In Sichuan, he received both the “Higher Education Teaching Award” and “Outstanding Contribution Award”. These led to him to receive funding from the German DAAD in 2001 to further his study in violin and chamber music in Germany as a senior visiting scholar. Invitations from United States, Canada, Germany, Italy, Japan, Thailand, Singapore, Taiwan, Hong Kong enriched his performing and educating life. In the past 10 years, he had regularly judged in national and international violin competitions. They include, the Ministry of Culture Arts Festival Youth Violin Competitions, CCTV Piano and Violin Competition, Golden Bell Violin Competition, International String Competition in Hong Kong, Italy Violin Competition, Chengdu Guangya International Violin Competition, Jinzhongjiang Violin Competition and many others.